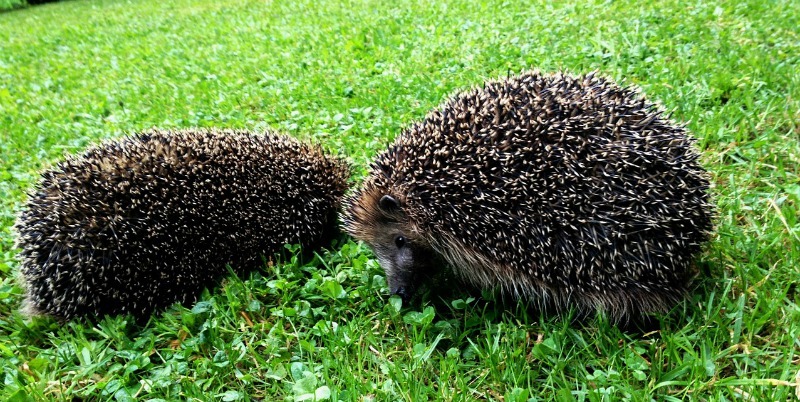 When hedgehogs meet they make a lot of noise with plenty sniffing and snorting. They even head but each other on occasion. 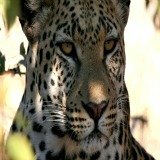 Have you wondered how they defend themselves against predators or how they breed? We look at the the answers to this and other interesting hedgehog facts. Hedgehogs are the only African animals with short spines which covers the whole back and sides. Their faces, legs and tail are covered with hairs. Each spine is a thick, stiff hair. 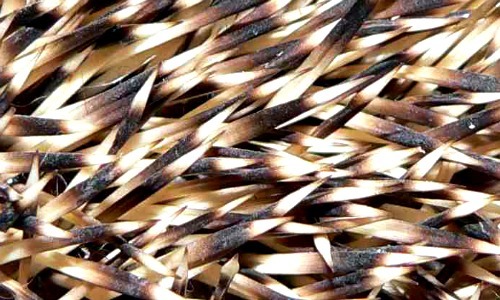 Each spine is white at the base, black or dark brown in the middle, and white at the tip. They have five toes on each foot, the ears are small and the tail is short. The natural habitat of these animals include semi arid areas with 300-800 mm rain per year. They occur in a wide variety of vegetation but not in very wet areas. They are usually nocturnal but commonly active at dusk and dawn. You will occasionally see them during the day when the weather is cool. You will notice they move very slowly while foraging. During the cold, dry, winter months when their insect food is scarce, they hibernate so they are rarely seen in winter. If they weigh less than 200 grams - they usually do not have enough reserves to survive through winter. 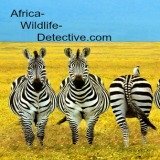 Although this is a site about African Wildlife we have been informed by a concerned UK hedgehog expert that there is a mistaken believe that hedgehogs have slugs and snails as their favorite food. The truth is that they only eat slugs and snails when their main food supply which are beetles are in short supply. 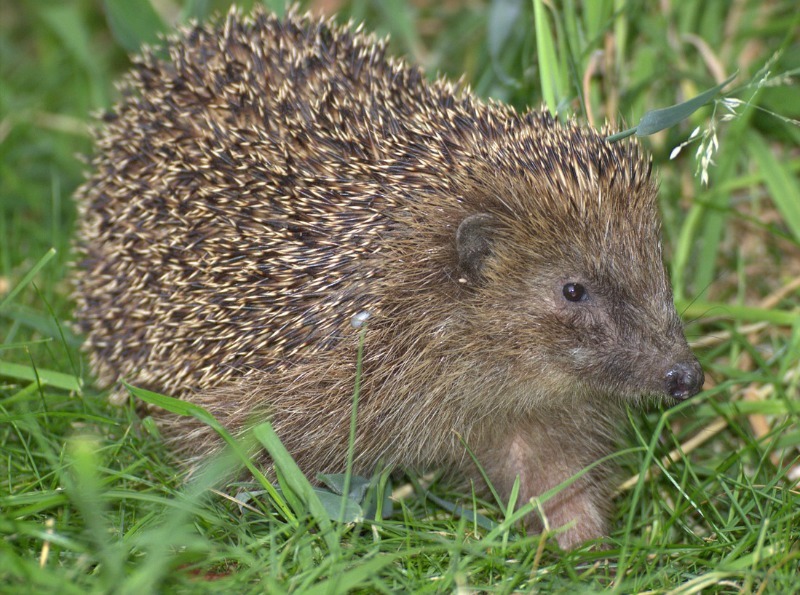 This mistaken believe results in hedgehogs becoming prone to lung worm disease in the UK. 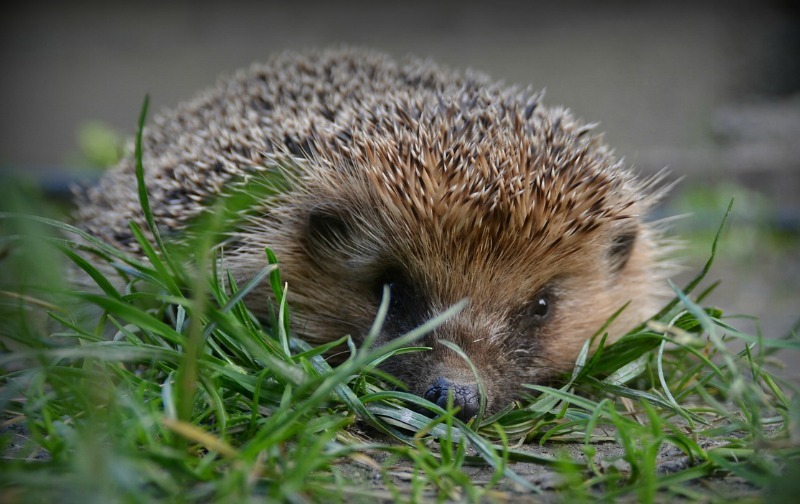 During hibernation hedgehogs lose about 19% of their body weight. Hedgehogs mating is rather noisy. The male and female circle each other while sniffing and snorting each other. While mating the female flattens the spines on her rump. The male holds himself in position by biting the spines on her shoulders. The newborns are blind and totally naked. The first spines emerge through the skin a few hours after birth. When do they become independent? 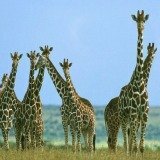 Which animals prey on them? In Southern Africa their main predators are Giant eagle owls that eat them in large numbers. These owls are not deterred by the spines, which seem to provide good protection against other mammal carnivores. 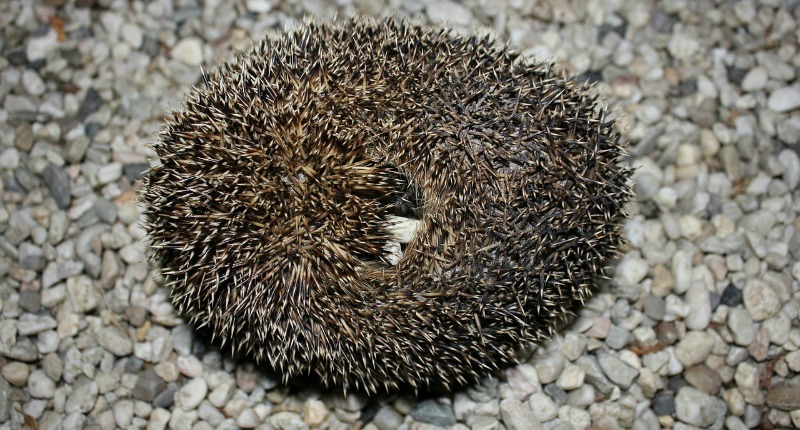 How do hedgehogs defend themselves against predators? These African animals are very noisy and do not seem to rely on concealment to hide themselves from predators. They rely instead on their spines to protect them from predators. When it is disturbed it rolls itself into a little ball. They are equipped with muscles along the sides of the body and across the rump that can contract. This allows them to pulls the spiny skin on its back down over its heads and legs. Their alarm call is a high-pitched screech. The result of this action is that they present a ball of interlocked spines to their attacker. This defense seems to very effective against lions. They also sleep in this position, so it is unlikely that they will get caught unprotected. When they are attacked they also make a puffing hiss in order to imitate a snake. Why are they so difficult to see in winter? When it is winter the days become shorter and food becomes scarce they become torpid. Torpor is a state of decreased physiological activity in an animal, usually by a reduced body temperature and lower metabolism. 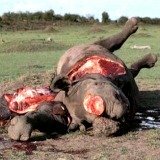 This enables animals to survive periods of reduced food availability. During that time they use less oxygen, breath slower and they have reduced coordination. That is the reason why they are more difficult to see in winter.